I’ve been trying to get my hands on some loquats for somewhere around two years. They aren’t that exotic and I’ve somehow procured far more difficult items, but the lowly loquat has always eluded me. Lots of people have these in their yards in southern California, just none of my friends apparently. And while I’ve stolen saved fruit from going rotten before, I never knew enough about loquats to try it. This hesitance baffles even me, since I appear to have a penchant for putting practically poisonous things in my mouth before I know much about them. 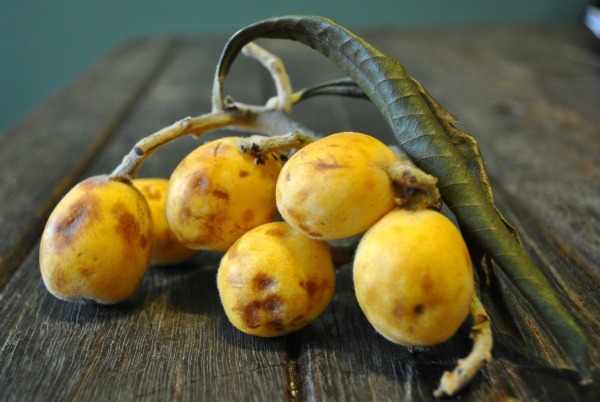 I have to say, I thought the loquats were great and I am baffled by their shy presence. I liked them far more than apricots for example, which seem to be everywhere. There is a great recent article in LA Times about them, which points out that they are a pome fruit related to apples and pears and are related to kumquats (thus the name I’m assuming). I found this surprising since they seem more reminiscent of stone fruit to me. The article also states that they are so ubiquitous in backyards that there isn’t a market for them in California, but I would wager a guess that 90% of my friends haven’t even heard of them. My little batch did bruise easily and they aren’t the most attractive fruit, so I guess that’s something in this vain little world we live in. But are they really that much uglier than mulberries (which look like maggots in my opinion) or citrons (which often just seem like deformed lemons)? I think not. 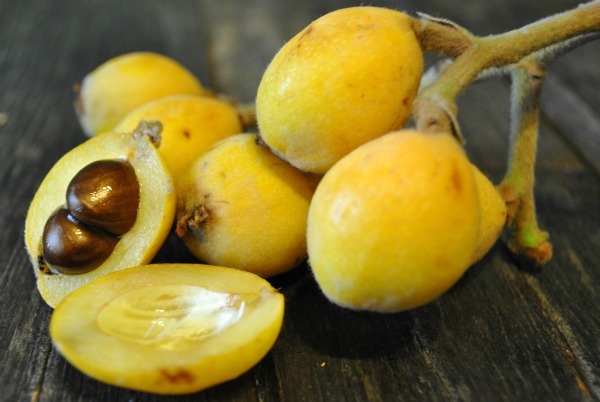 Let’s start demanding more loquats people! Don’t let a little bruising deter you. Muted yellow, oval shaped fruit with intermittent brown spots. Only about an inch long. Yellow flesh with a shiny chestnut brown seed. (I was told they are sweeter as they get more yellow, and the green are more bitter or acidic – so beware.) Don’t shy away from the bruised ones, sweet and yummy. Tender and firm with a slight amount juice. Similar to firm plum or melon flesh. Slight fuzz on the skin. Pleasant snap as you bite in to it, but not at all crunchy. Not overly sweet or complex. Reminds me of honey water, not that I have ever had straight honey water. This was a refreshing little fruit, with lots of appeal. If you like all the stone fruit, you’ll love these simple treats. I’m a fan. Loquats are far more common in China and Japan, where there are reportedly hundreds of varieties. I was lucky to find this small batch at the market and the saleswoman couldn’t name the variety for me. I find this is common with some of the more obscure fruit much to my detail loving dismay. My new book, Fruit is Fabulous: An Alphabet Book came out last week and much to my pure delight briefly popped right up to #2 on Amazon’s list for most popular paid kindle products for preschool and kindergartners. If you love fruit (and I know you do), this is a great way to spread the love to little ones. Check it out! I am a fan! When a roommate assured me he grew up eating them in the Middle East, I started to have a field day. Stanford and environs has many trees accessible to the sidewalk. I have never seen them for sale. They don’t travel well. I have since spread the gospel of loquats across the States and Europe. Well, I am more excited than any potential converts. Free food! We grew a loquat tree from a seed. It got to be 20 ft high when it was killed by some bug. Loquats have a dual seed and once it’s removed there really isn’t much fruit left. However, the fruit grows on you. The reason why they are hard to find in the store is that they bruise easily and they have a brief shelf life. SHipping them would be difficult. I suspect people would be disappointed with the quantity of meat per fruit. 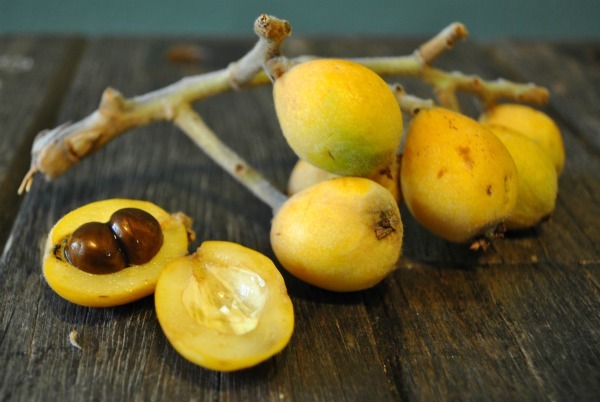 We made loquat jam once and it turn out well. BTW. You don’t list star fruit. You should get some and evaluate it. The fruit is grown commercially in Florida. It has an acidic-citrusy bite but it tastes something rather like an apple. The skin is eatable so there is no waste. It’s expensive (in California ~$2.99/each). The flavor is quite subtle.